Long ago and far away there seems little doubt that Gerry Adams was a senior figure in the IRAin West Belfast. How could he not be? His neighborhood was under siege from the British Army and every able-bodied man back in the days when the Troubles were at their height was involved. What is interesting about recent attempts to get Adams to admit the past is how the context is never given. Decades of complete Unionist misrule led to a tinder-box situation after civil rights marchers were batoned and beaten off the streets in 1968 and 1969. Dolours Price, now Gerry Adamschief accuser was caught up in it too, coming from a strong Republican family. In March 1973 she was arrested on board a plane going to Ireland just as a 300 pound bomb detonated at the Old Bailey courts and one person was killed and many injured Her sister Marian was arrested alongside her. Her time in prison did not go well. She and her sister went on a hunger strike and were force- fed for 200 days an horrific experience which has caused much of the mental trauma she experiences today. 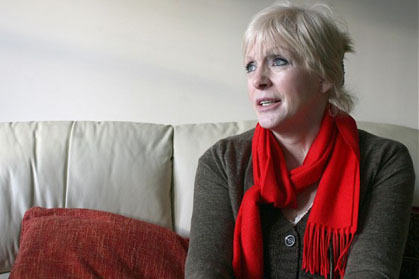 Almost 40 years on, Dolours Price the former wife of actor Stephen Rea, is sadly still suffering the effects. “She had a history of psychiatric problems and substance abuse,” said journalist Ed Moloney. “She has been diagnosed with PTSD [post-traumatic stress disorder], had been hospitalized repeatedly, and....(is) taking strong psychotropic drugs. Indeed, on the day she spoke to [The Irish News] she was on day leave from St Patrick’s psychiatric hospital in Dublin.” Moloney said referring to the controversial interview she gave to that newspaper where she first alleged Adams sent informers to their death. She is unrepentant about her past and makes no bones that she wants to destroy Adams and the process if she can. The Irish Sunday Times quoted her this weekend saying she defended her acts while in the IRA and actually enjoyed them. “It was an exciting time, there was no real order or structure to everyday life, the war had taken away all normal routine ... I should be ashamed to admit there was fun in it in those days,” she said. The same Sunday Times article notes that in 2001, Price was found guilty in a Dublin court of stealing prescriptions. “She seems to have an alcohol problem but is taking steps to address it,” said Judge Thomas Fitzpatrick . Five years later Price was disallowed access to Maghaberry prison, where she was visiting a dissident republican prisoner “She was verbally abusive and threatening and was in no condition to be allowed into the visiting area,” said a senior Prison Service source. She has also received three convictions for theft in recent years and has attempted suicide. Little wonder Adams does not feel it is politic to pursue her accusations against him in court. Those who are putting her up to the statements she is making, given that she is a seriously ill woman have a lot to answer for it seems to me. She should be allowed time and space to try and recuperate from her many problems It is sad to see her used as a “Get Gerry Adams” vehicle by sections of the media.